Post-“Jug” weekend finds a lot of division members resting after jaunts around the Delaware, Ohio half-miler. 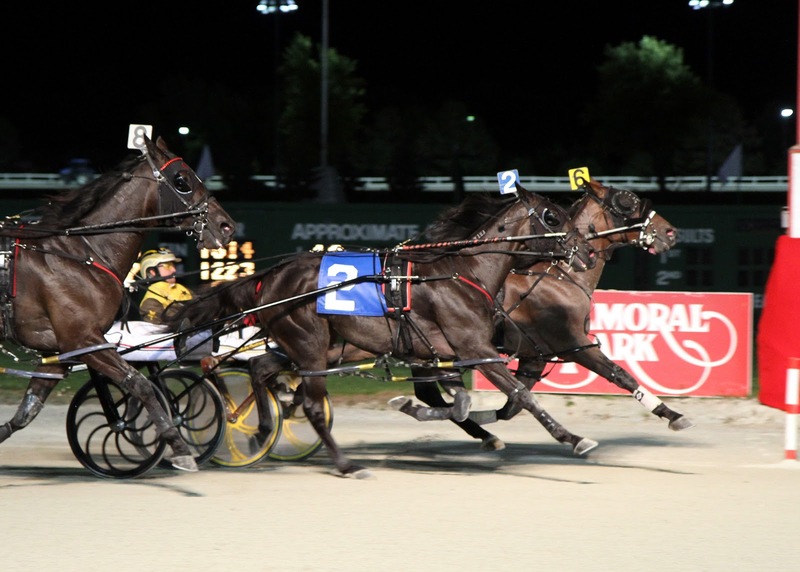 That doesn’t mean there are slim pickings; there are plenty of good races, classy sires stakes, and the big mare pace in Canada, to interest our wagering bankrolls. As the clock ticks for the Breeders Crown elims, “Crown”-eligibles are racing to the deadline of decision. We are covering all the division here and in our exclusive blog, Breeders Crown Countdown. The results about eligibles for the season-ending championships, will be available regularly at the Hambletonian Society website’s area for the Crown. This Saturday, Sept. 24, TwinSpires offers a full card of 10X points on the Vernon Downs program. New York Sires Stakes (NYSS) are sprinkled around the card. We’ll suggest some contenders in this blog. At Mohawk, the survivors of elims last week in the mare-pacer division meet for the $400,000 final of the Milton Stakes. Perhaps the fact that Dreamfair Eternal has shown her weak side, having lost once to Anndrovette and dead-heating with her in the elim, there will be an upset in the final. If we decide to look for value in contenders other than the elim winners we have to consider Laughandbehappy. Certainly she is the one contender that will be considered an overlay since the serious money will be on the dead-heat duo and Chancey Lady. “Laugh” can be strategically driven if the others are shuffling or dueling, so watch out for the upset. In New York and in Pennsylvania, home-breds battle for big bucks this weekend. On Friday, Sept. 23 at Yonkers, frosh-filly pacers line up for multi-divisions of the NYSS, each worth over $80Gs each. In division one, Crown-eligible Handsoffmycookie takes on a few critters desiring to hand her defeat. JK Fine Art may be able to sit pretty in the catbird seat and pace down the fast filly in Yonkers-style upset mode. In the second chapter, Major Look, who should be the second choice, could roll home on top with aggressive inspiration from top Yonkers reinster George Brennan. The nightcap is evenly matched, regardless of the tight morning-line odds between the 1 and the 3. We are still backing Ramalama, looking for the big race we expected from her already and at a price. Also Friday, the Meadows hosts three soph-filly trot Keystone Classics divisions worth $26,000-plus each. The first mile marks the return of Hambo-Oaks-longshot Bold And Fresh. Dan Altmeyer’s filly, Cutie Pie, shouldn’t be overlooked by you, especially if the crowd plows the money on “Bold” and the Dave Palone-driven entry. In round two, Linnea P will be a striking longshot from post 7 but should deliver far more than the odds prescribe. Then, in the trio’s finale, beware of Pantholops. This gal is going to use her speed to mangle a field soon and if this is the one, you will want to be holding a ticket with her number on it. Saturday, Sept. 24 at Vernon Downs, TwinSpires players can earn 10X points for wagering any race on the program. Seven of those races are NYSS events for pacers and/or trotters. Race 2 is for frosh-colt pacers. We are expecting Ray Schnittker to be wailing early with Art’s Delight, in an attempt to control the pace and steal it from wire to wire. Frosh-colt trotters line up for NYSS action in Race 3. Schnittker will be on the engine once more, this time with prohibitive favorite Delano. Out for blood after breaking badly last race, Delano in step will be tough to beat and impossible to play. Race 5, for frosh-colt trotters also, with five of the seven foes products of Conway Hall. So much for pedigree edges. Classic Conway deserves a shot and perhaps offers some decent odds. He is, hands down, the fastest of this mediocre group and could wire them with a smooth gait. Back to frosh-colt pacers for Race 6 and Bettor’s Edge. Linda Toscano’s young colt seems to have the kind of speed that is bottomless. He is green but that also means he is fearless and may be a monster in progress. Frosh-colt trotters are the subject in Race 8. Dan Daley’s Royal Shyster makes this mile impossible to wager unless the colt is the key to exotics, which won’t pay much anyway. Daley has this guy sharp and swift; it is his to lose. 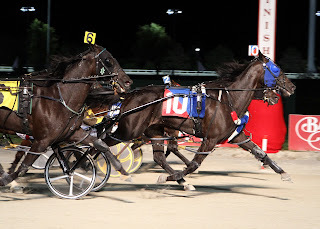 Race 9 is for pacing colts and Heston Blue Chip towers over the rest. Another key for exotics or a pass. And finally, for NYSS action, Race 10 brings together frosh trotting colts. From post 1, Armed Dangerously could be the leader from beginning to end. This field is evenly matched in many ways, so our choice may offer decent odds. Look what’s back: The no-takeout late Pick 4 at Cal Expo on Saturdays. We profited from this wager during the track’s most recent meet so let’s try again for a big win with conservative yet courageous tickets. Mystically Mine (1) and Red Star Fiona (7) won big races last out from the 8 hole. They should be raring to do the same in this field filled with horses that need a race in the new season. Mighty Fine Hi Ho (9) finished fourth after a tough but impressive trip. He was impeded at the start and then put on the speed to get the lead, though first over, and was burned out by that point. He could corral a big price here if he can get by the two that won last week. Franco Smoothie N (4) was all out to take the lead last week but could not get there. This caused him to be hung for three calls and he went the overland route strongly. That was a red flag, making him another possible big price. Millions (3) broke and was eliminated and must be respected again (he was the second choice). King Carver (6) was stuck on the outside trying to negotiate leaving from post 9. He could find a good spot and roll over this weak field. Remember to play any of the above to win, also, if you feel the win price offered is an overlay. i wanna have a horse someday!